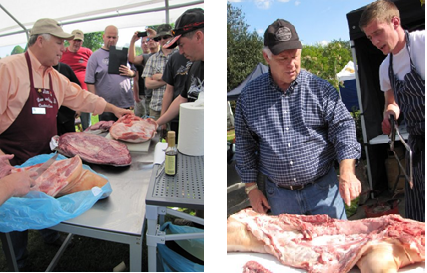 Butchery classes highlighting the differences between American and the local/regional cuts of meats are also part Jim’s offerings. Availability of US meat types and cuts legal for competition are discussed for butchers wanting to provide legal competition cuts to teams. Occasionally, at the end of the class, butchers ask for certificates indicating their knowledge of KCBS competition cuts.